Freed from Guilt … Freed from Shame! At one time or another in your life, people have probably told you that you are “going to hell” for being queer. The ramifications of their hate-filled accusations have reached deep into your spirit and brought you down. You may even believe that what they say about you is true. However, what those people have said is absolutely false. You are studying and worshipping with GLBTQQIA1 Christians at St. John’s MCC who regularly testify that they are saved, born-again Christians who are absolutely sure of their eternal security in Jesus Christ. They live with Christ now and will dwell with God and Christ for eternity. This study will help you understand how some people have twisted the Bible so that they can use it against us. It will do that by revealing God’s truth behind the stories and passages that have been used against us. In doing so, you will be encouraged to live a Christ-centered and empowered, liberated life as a GLBTQQIA Christian. There are lessons we can learn from the ancient stories. In order to be freed from the guilt and shame that others have heaped on you, you will need to take action. You will need to study diligently and take time to reflect on your study thoughtfully. You will need to suspend your trust in loved ones who want you to be straight. You will need to tell yourself it’s okay if you believe differently from the way that other people have wanted you to believe. You will need to open your mind to new ways of looking at scripture. You will need to decide that it’s okay to change your mind. You can change your mind and decide whether God and the Scriptures point toward a life of personal captivity and repression or whether God wants to liberate your innermost being and empower you to live a happy, full, and complete life – regardless of whether you are gay or straight. When my mother told me as a preschooler, “You won’t amount to a hill of beans!” she started me off on a path of feeling inadequate and rejected. She was just trying to get me to act better, but that’s not the message I got from what she said. Shame on me. Shame arises out of a sense of guilt. Many years ago, when my mother told my 12-year-old cousin, “You are too fat to amount to anything,” right there in front of the whole family at a reunion, my cousin was startled and then embarrassed. The next month, her mother died and she came to live with us. For the next six years, my mother continued her often daily harangue – heaping on guilt for being overweight. After several years, my cousin started to believe that what my mother said about her was true – she really wouldn’t “amount to anything.” What’s amazing about all this is that my cousin made straight “A”s in every class she took in high school – even the advanced college-level ones! She eventually became the class valedictorian for both her high school and college – a major North Carolina university. When she took early retirement several years ago, she had been the most honored high school teacher in the State of Delaware for more than a decade. Yet, she was convinced that even though she was so smart and could teach so well, she couldn’t function socially, since she was overweight – by five pounds. She never felt comfortable with personal, social relationships. She tried getting married to a wonderful guy, but didn’t think she deserved his love, so they split up after a few years. She has never found anyone she thought would love her. She has been bound by her toxic shame. What we have experienced because we are gay is very similar. Some people will tell us to our face that we are “going to hell.” Others say it behind our back, but we hear them. Even when we find a good friend with whom we can become intimate – even when the joy of our union together gets fulfilled, we are racked with our own self-guilt from within. We regret engaging in an activity upon which the world frowns. We are convinced that even God condemns our love even though there is nothing we can do about who we are attracted to – even though ex-gay reparative therapy programs such as Exodus might want us to believe we can. When this outward and inward guilt is repeated over and over, it becomes toxic shame. It becomes a part of us, and we become a part of it. Sometimes, the way we are “shamed” by others is very subtle. Even if no one has ever openly condemned you for being gay, shame may still impact your life. For example, if you think that it is inappropriate for you and your boyfriend or girlfriend to hold hands while walking through a shopping center when you see other couples – straight couples – holding hands, it is possible that some aspect of shame has affected your discomfort with public intimacy. Even if you should say, “Let’s hold hands no matter what they say,” your rebellion may be fueled by your expectation of disdain and a negative reaction. Shame has entered the picture again. Toxic shame can be crippling to our growth. A very few psychologists have tackled the effects that toxic shame has on people’s lives and very few have done any research on the subject. John Bradshaw looked into it and discovered some startling connections between “having been shamed” and the way we deal with that toxic shame. He found these eleven connections.2 I’ll give very brief examples of self-talk from each. Did you recognize any of those thoughts? Did you notice the passive/aggressive thoughts and behaviors? I recognize many of them from my life. I’ve said nearly all of them at one time or another. Bradshaw believes that toxic shame leads to the physical, emotional, and sexual abuse of others or of oneself. Toxic shame makes a person feel hopeless and helpless among many other “bad” feelings. To remedy that situation, a person will do almost anything to feel “better” – leading to addictions of all types. “Ingestive” or substance abuse. Behavioral or activity-based abuse. Co-dependency. Even border-line personality disorders. Make no mistake! Shame can be used in very healthy ways. In this study, we’ll go for the root of much of our toxic shame – the mistaken belief that even God finds us guilty of “the sin of being gay.” We’ll see what God really wants us to be and do. Then we’ll find ways of letting go of the shame that has imprisoned us. In their now out-of-print book, Letting Go of Shame, Ronald and Patricia Potter-Efron suggest what we must do.3 We must first understand what shame is and how it has affected our lives. We have already started taking that first step by taking this class. Then we must take action against our toxic shame. Even if we’ve resolved the issue of guilt over being gay, the things we used to do to make us feel better have become habits. Through Christ’s power, we must break those habits! We must take our first steps to correcting years of self- and other-abusing habits now! We’ll challenge our guilt and our shame and figuratively “give it back to our shamer.” That does not mean that we return the shame accompanied with hostility. To the contrary, when we return it, our “shamer” may never know that we have finally refused to let it have power over our lives. We will find ways to live a life in Christ that is full of self-respect. We will know that – without any shadow of doubt – God loves us and that we belong to God. We can spend weeks and years on this subject. Our study invites additional work to understand. The overwhelming number of people who begin this study shows an amazing thirst for relief from shame and guilt. It is my prayer that God will quench your thirst with “Living Water.” To understand what that Living Water is, see the events found in the Gospel of St. John 4:7-14 (The Message4). There is so much more to that story, but that Living Water is – among other things – your personal freedom from undeserved guilt and from toxic shame. Come to the Well. Its Waters are deep. I understand that a lot of what we learn in this study will be extremely foreign to what you may have learned as a younger Christian. You may disagree with all or part of what we teach. That is your right! I pray, however, that you will seek the mind of God anew with us so you can feel God’s liberating power in your life. In the space below, write the names and numbers of people you know who are willing to help. This group, like most small groups at St. John’s, is very special. During our time together, I hope we will grow in our understanding of God’s grace and power in our lives, but I also hope we will learn to trust each other. Therefore, we proclaim our study room to be a safe place. You will hear people tell about feelings that are very raw and very close to their hearts. We trust each other that no one will go out and tell anyone else when we share these most intimate thoughts and feelings. There is a spirit of confidentiality here. Your fellow learners trust you that you will keep what they say here confidential. You may, of course, tell anyone what you’ve shared with us about yourself here. You may even share how others have helped you in response; what insights you have gained. You may invite others to participate with us, even though they have not attended this introductory session. Read the focus verse and then the rest of the ancient story. Set the stage for what was happening in the ancient story and understand it. To whom was the story first told or written? Who first told the story? To what larger body of faith stories does it belong? Who were the players? What was going on in the community? In the religious community? What was the issue or problem needing resolution? How the story got twisted so that it could be used to abuse homosexuals. Who twisted this passage and why? How did they twist it? What did they have to think or do to make it say something different than what was originally intended? What is the result of such abuse? Set the present-day stage for the same or closely related issues. Replay the story as it might happen today in our community using words we can understand. What insights have we learned? It will not be possible to complete all the framework points in any one session. We will not move from one point to the next until we’ve gotten as much out of it as possible. Therefore, while we have suggested weeks for the various points, it is impossible to tell exactly where we will be in the outline from one week to the next. If you miss a session, please talk with Jim or others to see where we are and what you need to study in preparation for the next study time. Several of us gather 30 minutes early to share our bag dinner together. To get the most out of this study, please arrive a bit early so we can greet each other, have our prayer time, and be ready to begin at the appointed hour. If you arrive after that, please respect those who are already praying and studying. Do you think it is a sin to be queer? 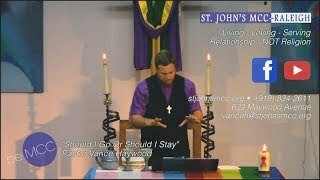 What have people said or done to you that leads you to think being gay is sinful? Is it difficult for you to understand how people can be practicing homosexuals and still call themselves “Christians” without kidding themselves? Look back at the eleven connections to toxic shame. Since you don’t have to admit it to anyone else, I want you to be completely honest with yourself. Do any of those connections appear fairly often in your life? As painful as it may be, think back to where the toxic shame that controls those connections started. In one or two words, list each connection with its source here. No one else will know what you’re talking about. It is possible that each connection has the same, single source. What gives the authors more “authority” than others of the time or of today? Were they “more holy” back then? More inspired? More authentic? You may want to see what Paul says to Timothy in II Timothy 3:10-17 to come up with your answer. Did all of the authors understand God’s covenant with humanity in equal depth? Did they all understand how to love our neighbors? Was their pen (that they used to inscribe the words) under God’s direction? Were all the translators also under similar direction? Did some authors, translators, or interpreters have reason to want to restrict and enslave God’s people? This song, written early in the 20th century, is found in many versions of Baptist hymnals and is sung by some of the most literalist and fundamental believers. It’s words are based upon Romans 10:13. How does it speak to you? “Freely come drink,” words the soul to thrill! O with what joy they my heart do fill! 1 Gay, lesbian, bisexual, transgender, queer, questioning, intersex, and straight allies, etc…. 2 John Bradshaw, Healing the Shame that Binds You, Deerfield Beach, Florida: Health Communications, Inc., copyright © 1988, pp. 88-95. 3 Ronald T. and Patricia S. Potter-Efron, Letting Go of Shame, San Francisco, HarperSanFrancisco, copyright © 1990. 4 Scripture passages marked (The Message) are taken from The Message: The Bible in Contemporary Language, copyright © 1993, 1994, 1995, 1996, 2000, 2001, 2002 by Eugene H. Peterson. Used by permission of NavPress Publishing Group.